2018 Nagaland State Assembly elections witnessed meteoric rise of BJP on the political platform in the state of Nagaland which set the wheel of discussions in motion regarding elections and the unsettling emergence of Bharatiya Janata Party (BJP) in the state politics of Nagaland on social media and other relevant platforms which have been overwhelming; as this is a phenomenon observed for the first time on the political landscape of the Land of the Nagas- THE NAGALAND. Until now, as we have seen, the debates and discourses have been primarily based on religion-the short- and long-term dangers posed by Rashtriya Swayam Sevak Sangh (RSS)-backed BJP towards the individuality and integrity of a one and only Christianity-dominated state in India. Although this is a crucial aspect, a similarly noteworthy and relevant field that has been somewhat neglected over the discourse is the ideological and cultural domain. It has been seen that the people actually perceive the cultural domain as a huge framework. This framework can offer an improvised as well as somewhat less complex but structured picture of current analysis of the problem being discussed, wherein anxieties and desires of Christianity-following Naga people and their discord with a right wing political party that evidently follows Hindu fundamentalism can be effectively expressed. It may be necessary to observe the BJP politics at a cultural level; or else, the possibility of being deceived by the intent of BJP to make India an all-inclusive- well-integrated Hindu nation, which is masked by the instantaneous perks of economic inducement and development cannot be denied. In addition to countrywide religious extremism and intolerance, such as assault and harassment against minorities, including Christians, BJP and its creators are using cultural hegemony, an apparently ingenious but a destructive method, for realizing ‘Hindutva’ and a subsequent Hindu country. Cultural hegemony is explained as maneuvering of the society’s beliefs, notions, practices, values, etc. by a ruling class that dominates or controls the society, which is culturally diverse, in order to transform the inflicted views of the class into the acknowledged norm or system. The concept of cultural hegemony was established by politician and philosopher Antonio Gramsci. Hegemony is dominance and control without force or coercion. Let us extend our thought process a bit further in this direction. During this election and before, the regional and state parties have gradually encroached to achieve political mileage, Hindu cultural hegemony, and a Hindu nation. Consequently, even ‘mainstream’ Indians, especially Dalits and other minorities, who oppose the Bramhinical social order, have seen BJP as a right wing communal party championing the cause of Hindutva. BJP supporters and its possible allies may proclaim that leadership and development in Nagaland are the primary aims of the party. It may be accepted; however, this justification is quite unconvincing and inappropriate in the context of the political discourse that has been a catalytic force in forming the abstract political identity of BJP. To provide the benefit of the doubt in this framework, it can be observed that the successful efforts of BJP and the other regional parties to form an alliance ‘for ensuring development’ was nothing but could possibly be their stratagem to reach the power center in Nagaland. These political parties, in this struggle, follow the ‘enemy’s enemy is a friend’ notion, although the parties follow divergent ideologies. However, these temporal arrangements made by parties to obtain power should be criticized to consider people’s interests, after all in Democracy it is Man and Man alone that matters and therefore political elites must refrain from taking the advantage of the disadvantaged. Politics is much more than mere material development and economic growth. For example, it is shameful to reduce Dalit political discourse in India or Naga national politics merely to the constrained rhetoric of development politics and commercial dreams. A country where Man is still discriminated in the name of Caste, Religion and Race cannot afford to sale dreams of money to its citizens. “The Hindu culture is the life-breath of Hindustan. It is therefore clear that if Hindustan is to be protected, we should first nourish the Hindu culture. If the Hindu culture perishes in Hindustan itself, and if the Hindu society ceases to exist, it will hardly be appropriate to refer to the mere geographical entity that remains as Hindustan….” (Source, from the article, “Hindu Nationalism in Action: The Bharatiya Janata Party and Indian Politics” by John Harris, South Asia: Journal of South Asian Studies. Vol 38. Iss 4, 2015). The interpretation of aforementioned lines is explicitly clear and unambiguous. If we attempt to circumvent or invalidate the claims that these Hindutva-based agendas are related to the Naga milieu, we are then straying from the focal point of discourse. Considering the sociocultural background of a Christian majority state, such as Nagaland, if we rule out the steady transformation of India into a Hindu nation to be irrelevant to the Naga interest, the attempt to attain control without any dominance has already started. Therefore, justifying and separating the ideology from good governance or development is very difficult because a party’s ideology supersedes any other promise or vision it presents. This developmentalist approach is suspicious as well as problematic, particularly if it is confined merely to the material development. Now, in reality, it can be inferred that RSS-BJP is not focused on fixing developmental issues, but it is attempting to nurture its values and principles in order to maneuver the nation. Corresponding to the discussion, this is real politics, and it is vain to be involved in politics without its true nature. In the context of Nagaland, an all-inclusive belief of societal or community progress also concerns the protection and promotion of the traditional way of life of Naga’s, that is, their morals, principles, and values that are in sync with Christianity. Therefore, the concept of development (whatever notion it is) through the perception of RSS’s political wing cannot correspond with the perception of a predominant Christian society, regardless of the Church’s successes and failures in the cultural domain of Naga society. Religion, but not culture, is exclusive; almost everything goes by and in the name of culture. Religion and culture are dependent on each other. If RSS cannot achieve its ultimate goal of Hindu theocracy, as noted above, it will follow cultural hegemony; the second best approach that is enrooted in the principles of sacred texts including the Vedas. Cultural hegemony can be characterised using one word–indiscernible, making it considerably dangerous. 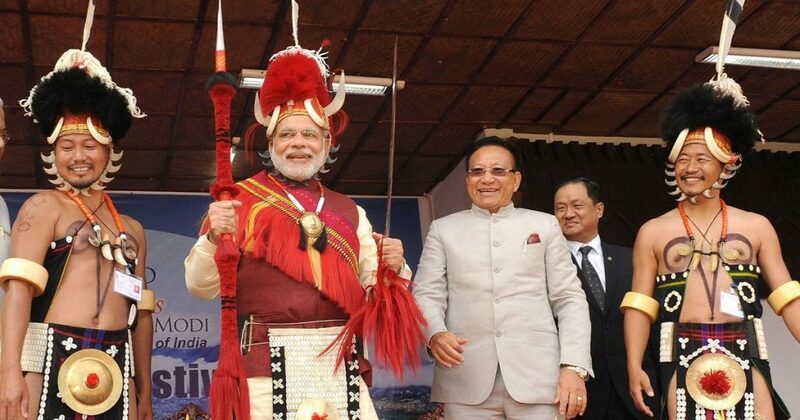 Currently, it may be seen that a form of social amnesia is being manifested in Nagaland. People are in their own world; busy in their individual struggles, worries, dreams and happiness; looks like the Nagas are lost in oblivion. To make it clearer, in simple words, social amnesia is observed when a group or community collectively forgets certain aspects because of several factors, including ignorance, changing circumstances, and forcible repression. The ardour, power dynamics and political equations arising out of the elections have made many of the Nagas forget about what they have faced, what is around them, and what can happen to them in the long-term if the alien influences are not opposed. A the end, It is not a question of religion- but a question of FREEDOM and RIGHT to remain liberated from the perceived threat of dominant alien culture, influence and moralities. Considering this problem, one must remember that although amnesia is temporary, enculturation and hegemony will work insidiously if Nagas do not recognize its influence and aftermath. The inclusion of parties, such as BJP, has a potential to strengthen the foothold of Sangh Parivar’s religious and cultural agenda in Nagaland which may begin a dark chapter of ‘Hinduised’ Governance in the Christian state of Nagaland.